WE HAVE MOVED TO OUR BIGGER & BETTER SAYREVILLE WAREHOUSE AS OF JANUARY 2014! Atlantic Belt was founded by Dan and Diane Iachio in 1986. The company was created to fulfill a need that Dan became aware of while working with a similar type company selling power transmission components, bearings, sprockets and gears. The Iachio's created a new company that would, in addition to selling these products, service its customers by installing, fixing and fabricating conveyor belt systems. Atlantic Belt focused on the newspaper industry and commercial bakeries, Dan's area of expertise. In 1991, the Iachio's began to see a decline in the amount of spending the ailing newspaper and bakery industries were willing to invest in their machinery. Taking a proactive approach, they decided to move the company in a new direction. The Iachio's relocated to Ocean County. Here they began building a reputation amongst the sand pits and stone mining operations of South and Central New Jersey. Atlantic Belt's customer base became the aggregates and recycling industries. Recycling was becoming increasingly popular. Dan saw the opportunity and need to become a good source of parts and service to these two industries that are similar in the types of equipment they use and the service they need. Atlantic Belt's name soon became well known in these niche industries. By 1997 they had expanded into New York, Pennsylvania, Delaware and throughout New Jersey. This expansion was achieved through word of mouth advertising and repeat customer business. Atlantic Belt was very successful in securing new accounts, servicing old accounts and providing parts to companies around the country. This expansion and success led to their becoming direct distributors for the national manufacturers of key products used in their core industries. These distributorships are only granted to companies that do a certain volume of business in a given year. Atlantic Belt, in addition to maintaining established accounts throughout the four states, saw an opportunity to increase sales by catering to local businesses looking for parts for their commercial machinery. Taking advantage of this opportunity, the company began operating a walk-in retail store out of their present location. This store has increased revenue and has proven to be a valuable resource for local businesses. Atlantic Belt is well known as a stocking distributor of heavy conveyor belts and power transmission products. 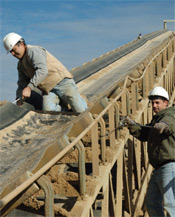 They have a stellar reputation for their reliable road crews and the excellent service and repairs they provide, including installation and maintenance of the conveyor belts, component installation, and conveyor repair including welding and fabrication.